Industry 4.0 is no longer just theory or a vision of the future. The idea of the digital factory of the future, in which humans and robots work hand in hand together, machines communicate independently with each other and everything is digitally and intelligently connected – the process from product development to production, logistics and finally to the end consumer – is becoming reality. In this context it becomes clear, that with the existing cable-based communication networks, especially in the lowest field level, the increased demands and expectations in terms of flexibility, mobility and expandability can no longer be sufficiently fulfilled. It is therefore just a logical step to expand IO-Link, already known for great simplification and cost reduction, by a wireless communication solution for the wiring of field devices. IO-Link Wireless, for the first time, presents a reliable, real-time and deterministic protocol for industrial factory automation control systems. By omitting cables, IO-Link Wireless offers considerably more flexibility, less wear and better scalability compared to its wired counterpart. At 10-9, the packet error capability (PEP) of IO-Link Wireless is comparable to the PEP of wired solutions and thus has a significantly lower probability of error than other wireless protocols such as Bluetooth or Zigbee. With IO-Link Wireless, up to 40 actuators or sensors (so-called Devices) with a maximum latency of 5 ms can be connected to an IO-Link Wireless Master. The 2.4 GHz frequency band is used for communication. The simultaneous operation of WLAN systems is also possible, because this technology blocks out occupied frequency bands. Thanks to backwards compatibility with the factory and process automation protocols, users do not have to replace their existing IO-Link system when installing IO-Link Wireless, but can integrate IO-Link Wireless seamlessly into their existing, wired system. KUNBUS Development Toolkits enable device manufacturers to enter the world of IO-Link Wireless quickly and easily. 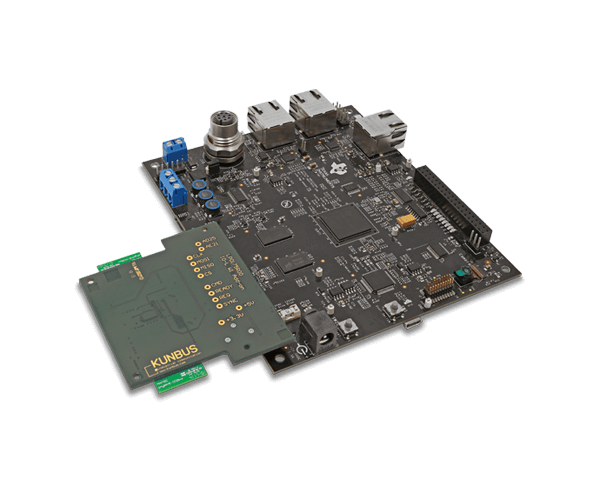 The toolkits are available for both IO-Link Wireless Master and Device development. 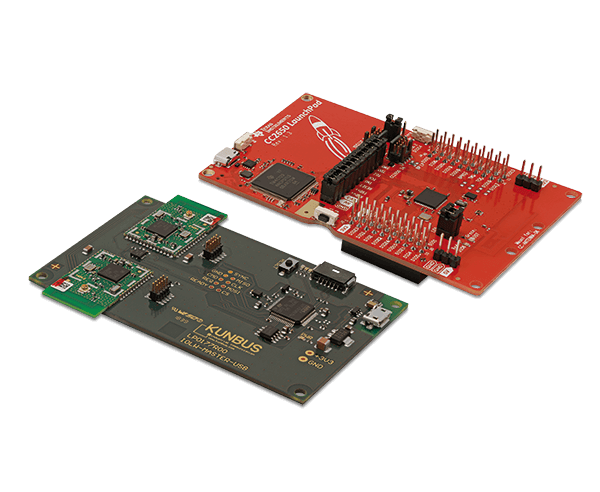 Technologically, we have chosen the SimpleLink™ CC2650 microcontroller from Texas Instruments. 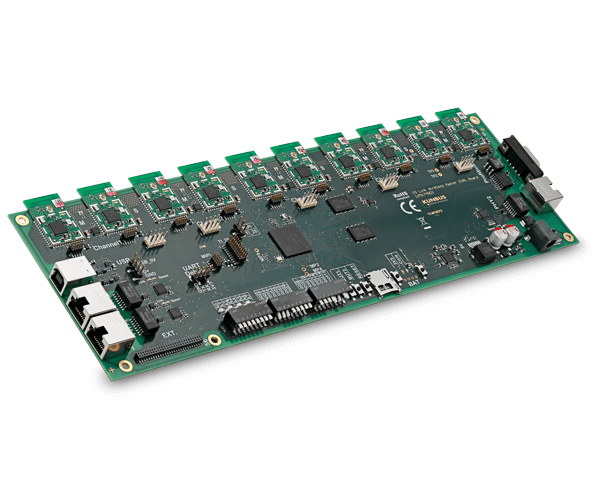 Compared to other microcontrollers on the market, the CC2650 offers high performance at very low power consumption. This allows potential applications with energy self-sufficient sensors, which are also covered by the IO-Link Wireless standard. The integrated Cortex-M3 of the CC2650 enables a single-chip design without a separate controller. The hardware footprint and costs can be significantly reduced. Thanks to the exact synchronization of the single radios, the IO-Link Wireless Master stack supports the implementation of 5 tracks with 40 connected Devices (sensors or actuators). Up to 3 Masters shall be able to communicate with up to 120 Devices at the same time within one RF area. For a seamless integration of an IO-Link Wireless Master into the superordinate fieldbus or industrial Ethernet level, KUNBUS also offers various interface solutions for all common industrial network protocols, such as PROFINET, EtherNet/IP and PROFIBUS. Sign up for our IO-Link Wireless newsletter and be one of the first to receive the latest news about our IO-Link Wireless product range.